Pricing is most important part of a company marketing mix strategies. 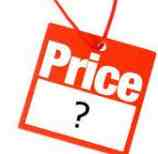 Pricing can help or hinder a company products or services sale. Every company sell either a product or a service, and all companies have to choose the price to sell their products or services at, which is difficult choice than most people realize. Pricing can be defined as the process of determining what a company will receive from its customers in exchange for the products or services it sells. It is very important for a company to manage its pricing strategies in allegiance with the requirements of industry in which company operates, the markets in which company supply its products, the customers with whom company transact and the objectives that company wants to achieve. Ultimately every company exists to make money, so the general aim of pricing strategies is to maximize the profit that the company can make. Following are some types of pricing strategies that can be adopted by a company to achieve its goals in accordance with its business nature. Many companies design new products or often some sorts of services first time in the market. In this case company adopts two type of pricing i.e. Market skimming price and Market penetrating price. But companies face some difficulties to set the price for its products and services for the first time. Top level management of the company considers many factors and decides either to go with marketing skimming price or market penetrating price. I am discussing both in detail. Skimming pricing strategy adopted by a company which enters into the market with a new and innovative product. Price skimming allows a company to market its new or innovative product at a reasonably high price, as initially company does not have competitors' concerns. However, skimming pricing is a short- term pricing strategy because competitors gradually enter in the market with their substitute products. Then company needs to initial high price of the product needs adjustment in allegiance with the make adjustments allegiance with the market conditions, for maintaining its market share. The best example is manufacturers of digital watches who used a skimming approach in the 1970s. After entrance of other manufacturers in the market as watches were produced at a lower per unit cost, other marketing strategies and pricing approaches are implemented by initial manufacturers. Cost of production should be low so company can generate revenue after offering high prices. Penetration pricing strategy is adopted by a company who is heading towards the launch of a new product that is already available in the market. it gets difficult for company to secure a reasonable market share as customer loyalty, once developed, it is difficult to exploit. So penetration pricing allows a company to market its product at such a lower competitive price, through which company can secure some of the market share and also exploit the loyal customers of its competitors. This strategy is effective in gaining the market share and helps in attracting a large number of buyers. This approach was initially used by Sky TV and France Telecom as they offered free telephones or satellite dishes at discounted or lower rates in order to attract more people for their services. In Premium Pricing Strategy the company produces a high quality product or unique brand and offers at a highest price. This pricing strategy is commonly used for luxury items or high end and high value goods, like expensive jewelry, boats, planes, estates, Savoy Hotel rooms, Cunard Cruises, and first class air travel. Company can only use this pricing strategy if its product's value is recognized by customers (market) as being a premium or luxury good. This pricing strategy treats generic or economy-type brands with a low price but for quality products. Company approach to economy pricing strategy must be rooted in a low cost structure, minimal promotion, minimal features, but still solid (not extravagant) benefits. In economic pricing strategies usually adopted when the customers of the company or brand are those who seek quality (quality conscious) and those who seek lower price (prices conscious). This approach is adopted by a company wants the customers to respond on an emotional basis, rather than rational basis. For example setting a Price Point Perspective (PPP) USD 999 not USD1000. Surplus price is also a best example of psychological price for example I student is going to appear in an exam and near the examination hall there is one stationery shop now if he need a pen or clip board he is willing to pay more for a pen or clip board than usual or normal price. Consumers might practice a decision avoidance approach when buying products in an unfamiliar market, like if in summer you entered in a new market and want to eat ice-cream, what you would like, an ice cream at USD 7, USD 12 or 20? Choice is yours. Geographical pricing is adopted by a company while setting prices for different geographical location in a country or in different parts of the world. So there is a variation in price for same product of a company in different parts of the world. For example in some countries there is more or less tax on certain types of product which makes them more/less expensive. In some countries tax more on alcohol or petrol in order to increase revenue, so price will be high. Geographical prices can be noticed when you do travel overseas you will amaze to see that some goods are much cheaper, or much expensive then your region. Summing up all a company should thoroughly analyze its product, its buyers, its competitors (and possible actions and reactions of these factors), and its market before company decide which pricing strategy would best-fit for the company products or services. Product life cycle and the change in the competitive environment always have great impacts on Pricing Strategies of a particular company. So, company also needs to review its pricing strategy on a regular basis to make sure that the fit remains the best. If a company will adopt effective pricing strategies, it will become able to secure better market shares and enhanced profits. Pricing, if managed effectively by a particular company may also lead it towards market leadership.